MultiPing is powered by Pingman Tools, LLC. Check out our other products. 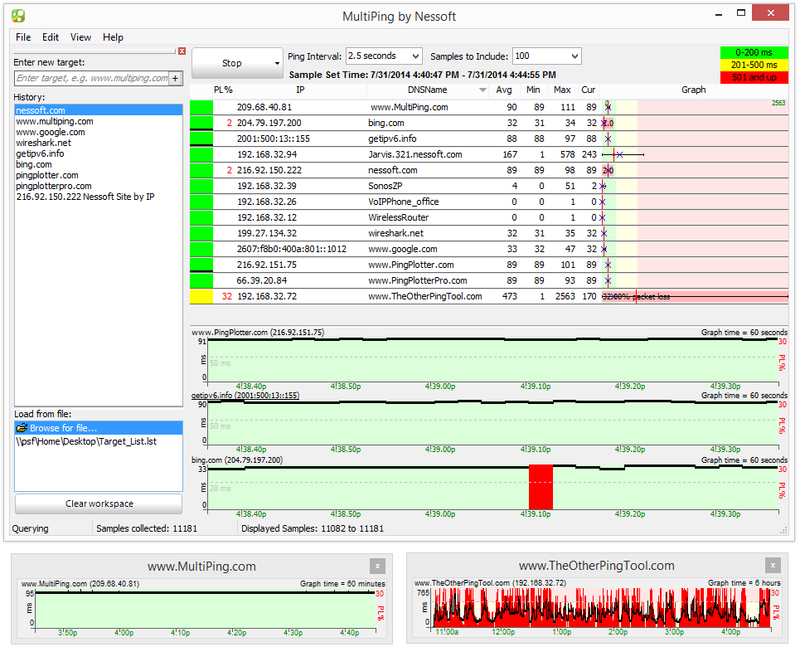 MultiPing provides a graphical view of network performance, monitors hundreds of targets, and sends automatic alerts. This affordable tool is great for professionals and newbies alike, and can be monitoring your network in less than a minute. Visually represent networking metrics. Compute packet loss % as well as avg, min, and max latency. See performance over time, identify patterns, and improve understanding of network issues. Continue watching (or alert) when target IP addresses change. Send emails, play sounds, launch executables, change icons, or log to files when network issues occur. Scan a range of IPs and automatically add responders to the target list. Mix IPv4 and IPv6 as you migrate to the protocol of the future. Share data with PingPlotter for advanced troubleshooting. Browse performance history by dragging, focusing and zooming in on periods of interest. Undock, resize, hide, and reorder graphs to keep an eye on what's important to you. Copyright 1998-2016 Pingman Tools, LLC. All Rights Reserved.